Before we post your Weekend Homework Assignment, allow us to briefly recap this week on The Gottman Relationship Blog. On Monday, we introduced Drs. Gottman & Levenson’s findings from their three year study (1980-1983) on Physiological and Affective Predictors of Change in Relationship Satisfaction. On Wednesday, we went into depth about their findings and discussed the effects of physiological flooding on an individual’s ability to communicate during conflict discussions. Drs. Gottman and Levenson found that the frequent ongoing experience of overdrive in physiological arousal (flooding) in a couple’s interactions lead partners to maintain a state of constant hyper-vigilance in the expectation of punishing experiences. Couples learn to engage in deeply harmful behaviors when faced with difficult situations – the affective and physiological signs of which you can read about here. Today, we’d like to give you a chance to make these findings work for you! 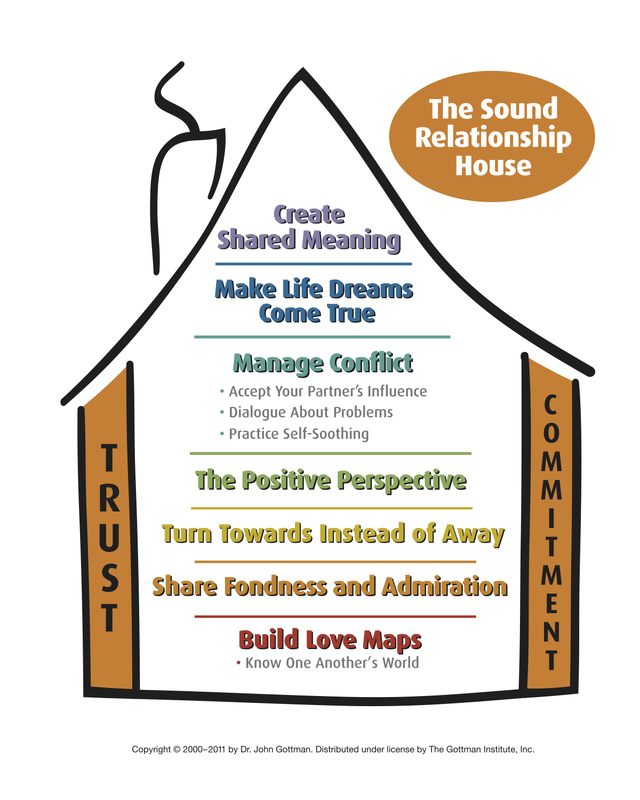 First of all, we’d like to remind you to practice investing in your relationship’s Emotional Bank Account, to begin reconnecting with each other in positive ways by practicing Turning Towards, to work towards nurturing a Positive Perspective using the skills of Conflict Management, and to work on building and strengthening your Sound Relationship House. These tools will help you to overcome your built-up expectations and responses to negative interactions from the past – allowing you to avoid constantly setting off the alarms which trigger a self-fulfilling prophecy of relationship disaster. However, it is extremely important to also focus on learning mechanisms for physiological self-soothing when flooding does happen! All of us have experienced what Dr. Gottman refers to as emotional and physiological flooding. If the Four Horsemen are present in a conflict discussion with your partner, you may feel overwhelmed by a barrage of negativity, both real and perceived. As adrenaline kicks in, all systems are in overdrive, and constructive conversation becomes totally impossible. If you keep going, you’ll find yourself exploding at your partner or imploding (stonewalling), neither of which will get you anywhere. In Seven Principles for Making Marriage Work, Dr. Gottman writes about his research on flooding, explaining that “if your heart rate exceeds 100 beats per minute, you won’t be able to hear what your spouse is trying to tell you no matter how hard you try.” It is physically impossible to communicate. According to his own studies and those of other researchers, including Robert Levenson, Ph. D., and Dolf Zillman, Ph.D., Dr. Gottman has been able to show that men and women are curiously different in their responses to flooding. Because of biological differences in the way that our bodies respond to stress, perhaps stemming from evolutionarily adaptive mechanisms developed in our cave-dwelling days, it is still more difficult for men’s bodies to calm down after an argument. Women calm down more quickly because it takes less time for their cardiovascular system to recover from stress. Caught up in the heat of the moment, however, we all experience the physiological signs of stress: sweating, shaking, and being short of breath – a state in which it is completely impossible to think clearly about anything at all, much less to resolve a complicated problem with our loved ones. We lash out. Try something that may feel totally foreign in the heights of your distress: breathe. Practice physiological self-soothing by imagining your favorite place, a place you can get lost in, a place in which you feel untroubled and where you can float peacefully within yourself. Meditate on this place. Do not dwell on your argument or think thoughts that maintain your level of distress. Don’t focus on getting even. Avoid thoughts of righteous indignation (“I don’t have to take this anymore”) and innocent victimhood” (“Why is he always picking on me?”). Instead, spend your time doing something relaxing, such as listening to music or exercising. In one particular empirical study on flooding, we interrupted couples after fifteen minutes and told them we needed to adjust the equipment. We asked them not to talk about their issue, but just to read magazines for half an hour. When they started talking about their issue again, their heart rates were significantly lower and their interaction more positive and productive. When we are caught in the eye of the hurricane, all bets are off. We hope that practicing the skill of physiological self-soothing this weekend will gradually make your conflict conversations with your partner feel less tempestuous.